BIXBI® Skin & Coat does not provide adequate information in regards to this product. 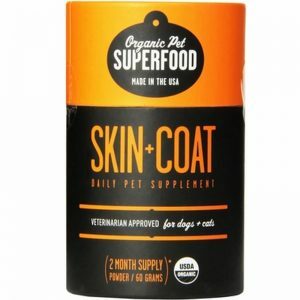 We were only able to find information claiming that this product is suitable for dogs and cats with seasonal allergies and it retails for under $30. Use alone or in conjunction with our IMMUNITY formula. Administer orally daily ¼ teaspoon (.5 grams) per 25lbs. Organic Cordyceps, Organic Turkey Tail, Organic King Trumpet, Organic Reishi, Organic Beech. Vitamins B1, B5, B12, C & E; Copper; Potassium; Riboflavin; Niacin; Fiber. 100% Organic. BIXBI® Skin & Coat is made in the United States and claims its veterinarian recommended. BIXBI® Skin & Coat is applicable on dogs and cats with allergies. Use as directed to achieve best results, if any results may occur.